1. Boise State squeaks by a win against Nevada and thinks the masses outside of Ada County Idaho care! 2. Like every year, conferences with parity, the always state goal, are shut out of the playoff picture. That is always west of the Missouri River, the Pac 12, specifically. 3. Utah is the thorn in the sides of Pac 12 schools. Whittingham an underrated coach. 4. I thought Georgia Tech were engineers and they never heard of super glue? 5. After the loss to Tennessee Auburn will only move up 2 spots in the rankings! 6. Auburn fans have short memories. 7. Spence. Flossing at half-time? Tell the truth, have your kids taught you? 8. Derek. There's next year. Was not the week to give the defense off. 9. In the best ‘watching game’ Washington was the big loser and talk of Oregon is just ridiculous, they will lose two more games. Cristobal is for real, I think. 10. UCF should go undefeated so they can experience the committee’s who cares. Of course, they are on the East coast, that could be telltale. 11. Cane. Maybe you and Derek can find a meeting. 12. Like Washington/Oregon the Miami/Virginia games were won/loss by the coaches. 13. Chip Kelly’s win will at least keep him out of the news. So yesterday. 14. Colorado loses and they will be totally irrelevant but keep Pac 12 parity alive. 15. Alabama is so boring. Look for Sabin to stir the pot about something this week. 16. Penn State’s past problems make the nation not care they loss. Amazing how that lingers. 17. Mountainman. I think Derek and Cane need an empathetic friend. That game stunk. 18. A bye at Florida State, at least our dear friend Mr. Billybud doesn’t have to worry about that. Keep the faith. 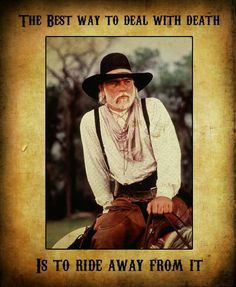 One of my favorite Western Movies is ‘Lonesome Dove’. In one of the scenes a young trail hand dies a gruesome and tragic death. Captain Call, Tommy Lee Jones, says after the burial to his sad and grief stricken cowboys, “The best thing you can do with death, is ride off from it.”........ and now this morning, after that absolutely awful performance by the Mountaineers last night, I’m going to saddle my horse. I try to keep up with as many teams as possible. I don't know a certain team inside and out, and conferences the same way. The way some of you are talking, a lot of these highly ranked teams could suffer two losses. Will this be the first year a two loss team makes the playoff? Especially if the market is going to appeal to the masses. I mean this is way out there, but Duke has one loss. Say Duke pulls off winning the ACC with that one loss. No way they are in. collegefbfan-8898 wrote: I try to keep up with as many teams as possible. I don't know a certain team inside and out, and conferences the same way. The way some of you are talking, a lot of these highly ranked teams could suffer two losses. Will this be the first year a two loss team makes the playoff? Especially if the market is going to appeal to the masses. I mean this is way out there, but Duke has one loss. Say Duke pulls off winning the ACC with that one loss. No way they are in. At last, the truth has been spoken.